There are 7 blog entries for August 2009. Sunday, August 30th, 2009 at 12:08pm. Safeway's new boutique urban grocery store, The Market opened in downtown San Jose high rise The 88. Featuring an extensive assortment of prepared foods and quality groceries (including 200 cheese options! ), The Market is the perfect addition to the rapidly developing neighborhood. The Market is a smaller, upscale neighborhood version of Safeway that occupies 24,000 square feet of retail space at the new condominium highrise. The store is half the size of normal Safeway stores but still be a full-service grocery store. Just a few weeks ago, residents delighted over the neighborhood addition of Love's Cupcakes, an addictively-sweet destination located just steps from The 88's lobby. Saturday, August 29th, 2009 at 12:34pm. Saturday, August 29th, 2009 at 12:24pm. Rates on conforming loans up to $417k and super-conforming loans up to $729k are net even for the second week in a row, which is rather shocking given the volatility of the last 18 months. Rates for jumbo loans above $729k remain steady because those rates don’t trade all day every day like conforming loan rates do. The mortgage bonds that rates are tied to were about even this week. Improving housing and economic data hurt bonds (home prices measured by S&P Case Shiller declined less for fifth straight month, 2Q2009 GDP was -1% instead of -1.4% expected), and tame inflation data helped bonds (measured by the Fed’s favorite measure: Personal Consumption Expenditures Index). Friday, August 21st, 2009 at 6:02am. 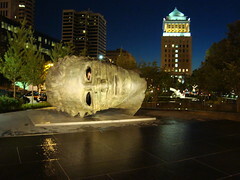 A public garden with spectacular landscaping and internationally renowned modern and contemporary sculpture in a completely open, accessible downtown setting. Citygarden is an oasis in the City with multi-dimensional appeal — marrying art and nature, stone and water, architecture and design. It features fountains and pools, a waterfall, places to sit and even stretch out, and a café. No walls or fences surround it. Admission is free. "This new garden is immediately taking its place among the great cultural attractions of St. Louis for residents and visitors alike," St. Louis Mayor Francis Slay said. "It’s dazzling, and its complete openness in the heart of downtown makes it unique in the country." Tuesday, August 18th, 2009 at 3:55pm. All the sales people (staff & management) in the new San Jose condo communities work for the “Same Broker” who specializes strictly in the marketing and that sales new San Jose condos. They collect all the numbers and statistics from all the communities on a weekly basis all for the purpose of marketing. Many of my clients that register find that they will receive many blasts daily and follow up calls all the time from the staff of the downtown San Jose condo communities. Be aware of the Low Promotion Price … “HOME OF THE WEEK!” for example the price appears to be significantly lower than another identical condo model. The difference is the location of the condo is far less desirable or the upgrades and features might be substantially cut. Tuesday, August 18th, 2009 at 6:49am. If you're looking for a glimmer of hope in the Dallas-Fort Worth home market, the latest industry survey provides one. D-FW home sales prices were basically flat in the second quarter after a long string of declines, according to the National Association of Realtors' closely watched nationwide survey. The median price of homes sold in North Texas was down just 0.2 percent from a year earlier in the Realtors' second-quarter survey released Wednesday. Nationwide, home prices fell by a record 15.6 percent during the same period. Wednesday, August 12th, 2009 at 2:24pm. Rates on conforming loans up to $417k and super-conforming loans up to $729k continue to trade up and down as much as .5% per week, and this week we’re on the wrong side of that. Rates on Jumbos from $729k to $3.5m are about the same. Unlike loans up to $729k, jumbos aren’t currently securitized, so while jumbo lenders look to mortgage bond markets for pricing cues, jumbo rates are priced more according to lender competition than mortgage bond trading levels.